Teaching English abroad is a great way to live out your passion for travel and feed (or develop) your passion for teaching. On top of that it can be a great way to feed your other passions as well! That’s exactly what our grad Jonathan is planning to do when he goes to China to teach English this Summer. 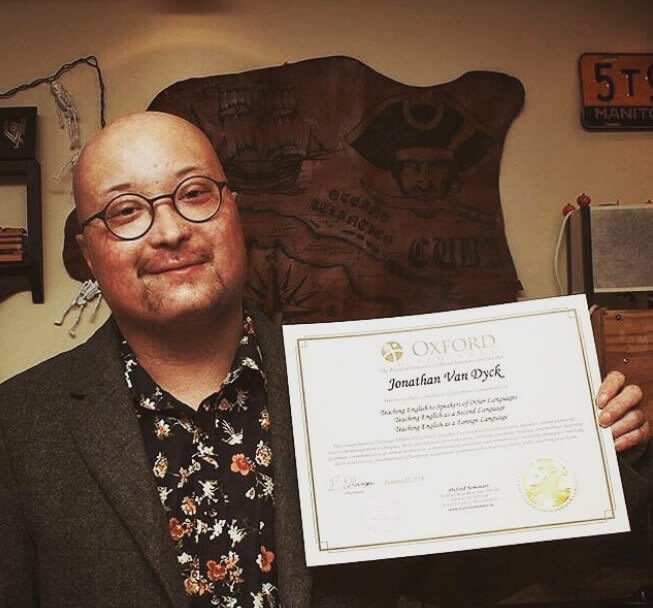 Jonathan is an avid tattoo blogger, and one of the perks of bringing his side hustle with him while teaching English in China is the opportunity to learn all about China’s fascinating tattoo culture. Watch the video below to hear about Jonathan’s experiences in our course and his plans for his upcoming adventure teaching ESL in China! 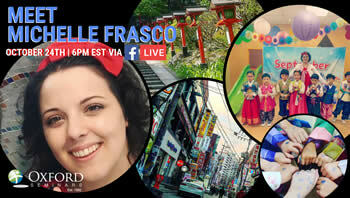 Want to get started teaching English abroad? What were you doing before you decided to teach English abroad? I’m a part time photographer, which is sort of my main gig at the moment, and I’ve been doing that since I was in high school actually. So it’s quite a bit of fun. A couple years ago I started writing a tattoo blog because I became really interested in tattoos when I turned 18 and I just found that there wasn’t the information out there that I was wanting. So I started doing my own research and writing my own blogs, and it took off pretty quickly. I have a pretty decent following now on my blog which is nice. It also helps my photography. I can kind of advertise the two with each other. What made you decide to teach English abroad? I love traveling and I really wanted to be able to travel more and actually live abroad. And I thought the best way to do that would be to teach English! So I started looking into different courses. I actually found Oxford Seminars through an ad on Instagram, I think. I went to one of the information sessions and signed up right at the end. What was the certification process like? With his TESOL/TESL/TEFL certificate in hand, Jonathan is planning to teach English in China. It was 6 [days] of in-person [classes]… on weekends and it was pretty full days, long days, but my instructor was fantastic. He was a really nice guy. He made the classes interesting and fun. And after that was done I started my online portion of it [the course] pretty much right away… I think I did it in about a month. I was doing it in the evenings mostly, but it wasn’t too strenuous. And after that I got my…certificate in the mail. What made you pick Oxford Seminars? So, actually the big thing was that it was in-person, because I don’t have actual teaching experience. So I thought the in-person [classes] would be a better way of learning…because at the end of it you have to actually teach a lesson to your class… It was a really good experience. You get good feedback on it from your classmates and also from the instructor. So it was really the in-person part of it that made me pick [Oxford Seminars]. How did you start your tattoo blog? Are you going to continue it while teaching English overseas? Yeah! 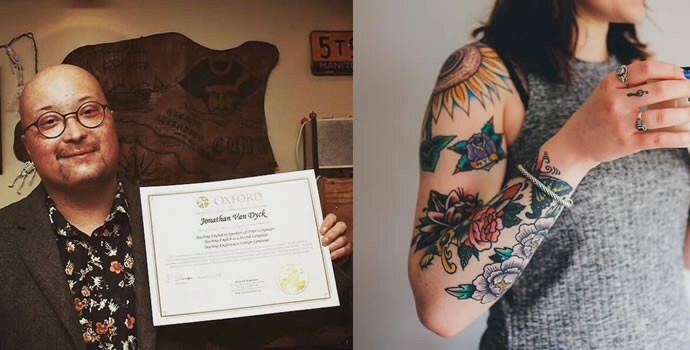 Absolutely!… I started doing my own research and writing my own blog posts about different tattoo artists and designs, and tattoo history and culture. And with the history and culture, I really want to incorporate that into working [teaching English] in China because China has a fascinating tattoo history. I’ve done one post so far but I’d love to actually visit some of the places where these more ancient tattoo traditions are still alive. So I’ll definitely be continuing that and I’ll also be writing about artists that are in China as well. 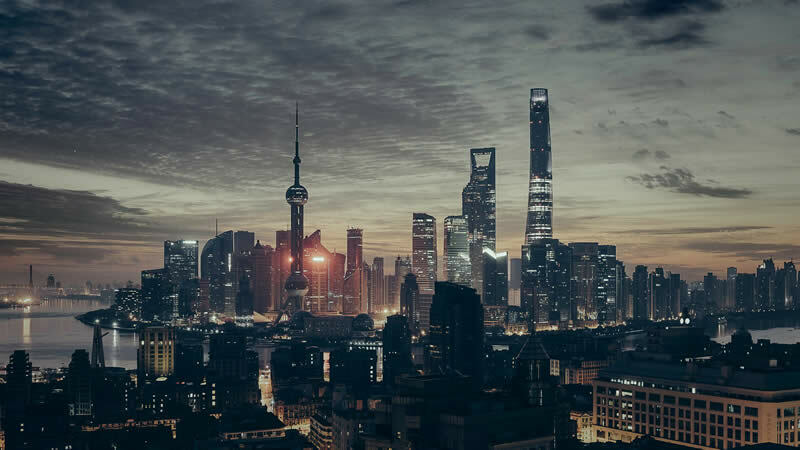 How did you find a job teaching English in China? I got in contact with my Job Placement Advisor and I think he answered me within maybe an hour after I emailed him, which was awesome. And he walked me through the process online of picking countries that I was interested in and building up my resume so that it would look good for teaching English. Once all that was done then he sent me a few links to schools and companies that he was going to send my resume to so that I could research them a little bit. And I think within maybe a couple days I had a call from someone in South Korea actually. And that one I didn’t end up going with but I had an interview within a couple days. Then I had a few more companies that he sent my resume off to and then I had the one from China and he told me he was sending that one. And I think within 40 minutes after he had sent that email to the company in China, a recruiter for that company called me and did an on the spot interview. And then we did another interview after that, a few days later and then I was offered the job! So the first interview was when he called me to basically make sure that I was going to be more or less a fit for what they were looking for in the company and that it was what I was looking for too. And then the second, longer interview was a Skype interview. He gave me a couple weeks to accept, and I think I took about a week just to research the company more and the city just to really make sure this is what I wanted. And then I sent my reply and accepted it and I’ve been slowly working on the visa process for them because for China it’s quite extensive. When do you leave for China? Jonathan plans to visit the Great Wall, Beijing, and some of China’s Buddhist temples while he is teaching English. I have until…June 15th to get all my documents completed but I’m actually going to be backpacking Japan and South Korea for all of May and the beginning of June so I have to finish it before I leave, which is May 7th. Do you have any interview tips for new ESL teachers? For Skype interviews, I would recommend practicing with a friend. Just make sure that your Skype presence is good. It’s a little different than doing it face to face in person. So…making sure you have good sound, good lighting, for whatever’s in the background, clean up a little bit if you have to. And definitely practice for the Skype interview because it’s a little different. Do you know what type of class you’re going to be teaching? I’m going to be teaching adults, eighteen and up. And I was told it’s going to be mostly university-age, so roughly students my own age actually, which should be interesting. And this company that I will be working for does some 1 on 1 classes, some pair work and some group classes, and I think the maximum size of my classes will be 10 to 15 people, but starting off it will be smaller class sizes, which is nice. Do you know what your housing will be like? Does the school pay for your housing? I get two weeks once I arrive in China to apartment hunt. They set me up with an agent and give us an orientation for how to go about actually finding an apartment…. [housing] is not [covered] for this job, but because so many teaching jobs, especially in China, do actually pay for your housing, this job has a higher salary. Did you have to negotiate your contract at all? I didn’t actually have to negotiate because everything in mine…was good, but right away, when I got my contract I sent it over to my Placement Advisor so they could look over it. They were great at walking me through what everything meant. There are a lot of technical terms in it that aren’t used in everyday language, so they went over everything with me. 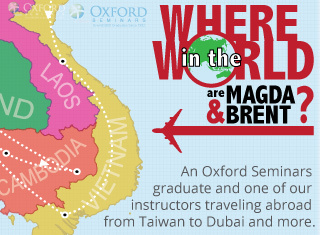 Where else do you want to travel while you’re teaching abroad? Shanghai, China’s largest city, is becoming more and more well known for its vibrant tattoo culture. 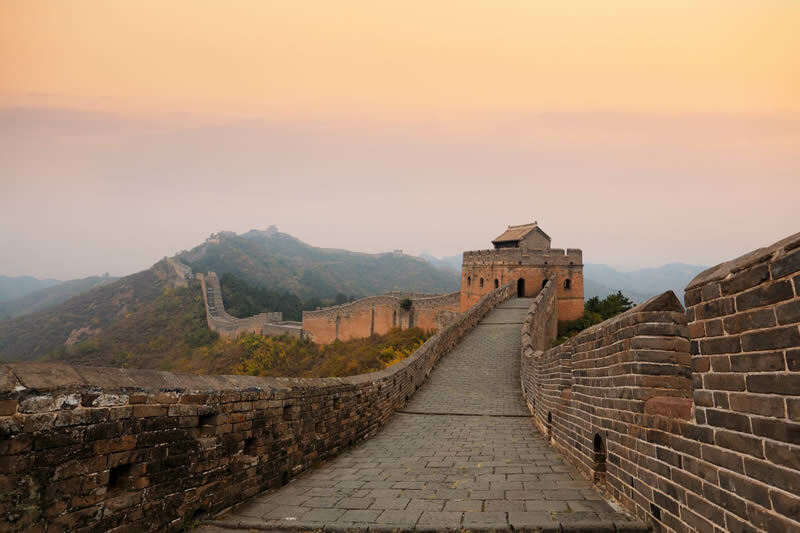 South Korea and Japan, I’m actually doing in May, but once I’m in China I definitely want to see the Great Wall, so I’ll probably go to Beijing for that and do a bit of a tour around there. I’d also really like to go to Shanghai. That also ties in with my tattoo interest. There are a lot of great tattoo artists in Shanghai so I definitely want to get tattooed in China as well. I also want to visit some of the older temples, the Buddhist temples, and the mountains, and see some forests and parks in China as well, and not just big cities. Do you have any advice for people thinking about teaching English abroad? So I decided [to teach abroad] after the free information session. I think anyone who’s at all interested [should] definitely check out a session in your city. They have great information. They can answer all your questions about the course, and it is a really great course. If you’re wanting to travel, wanting to teach, I think you should just do it. Start your ESL teaching adventure!